This just in the GREATER NEW ORLEANS photo date 23 March, 1928 when the boat had only been in the excursion business for about a year. Probably toured the harbor and maybe down to a few bayous. Fred Way's profile on the boat below. Unusual industrial strength derrick in the foreground to operate the swinging stage with. Seems like a bit of overkill for the relatively light lifting it was required to do. Looks like a large scale version of those things a kid could build with an Erector sets. 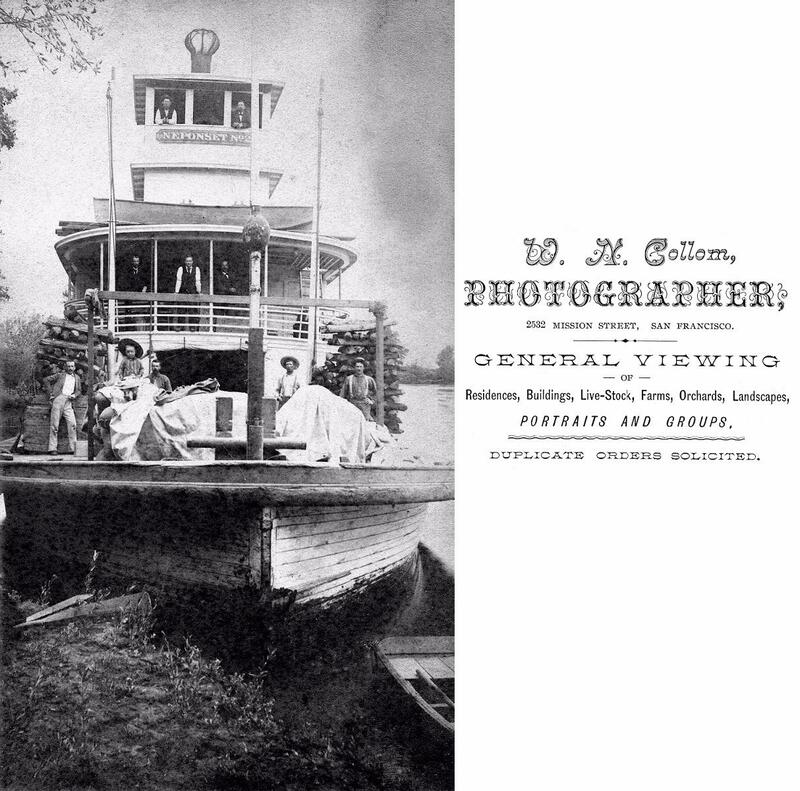 GREATER NEW ORLEANS - Sternwheel excursion boat built Cincinnati, Oh., 1895. 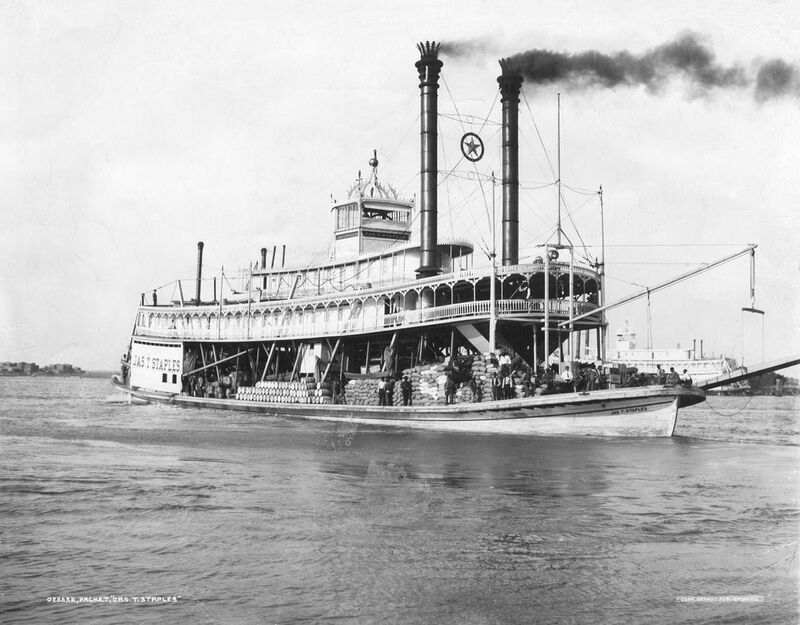 Originally named VIRGINIA, then STEEL CITY, then EAST ST. LOUIS, then ISLAND BELLE (all see). Under the latter name was sold in April 1927 to Greater New Orleans Amusement Co., headed by C. Maestri, completely rebuilt at Paducah, and renamed. 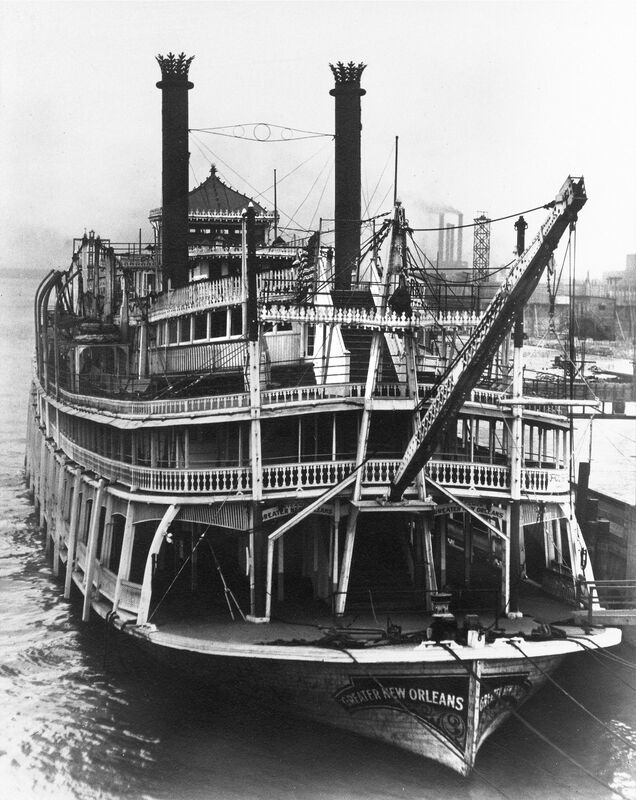 Ran excursions at New Orleans for a year or so, then was sold to Streckfus Steamers, St. Louis who dismantled her and used the boilers on their excursion steamer WASHINGTON. Attached 8 x 10 from Bert Fenn's collection that ended up on eBay. You may find the the boat in early stages of construction interesting. On the St. Paul, summer 1913, it's one of my all time favorites since it makes you feel like you're standing where the photographer was . . . like a door opening onto a dream with the reflective water in the distance and the feeling of serenity (except for the little boy on the right with his hand up to his ear . . . that wildcat screechin' of a cally-ope is difficult to endure at that close range and since I have Tinnitus it really raises Hell with my ears. Wedding cake gingerbread on pilot house roof, the picturesque Alabama steamer JAMES T. STAPLES was built in 1900. 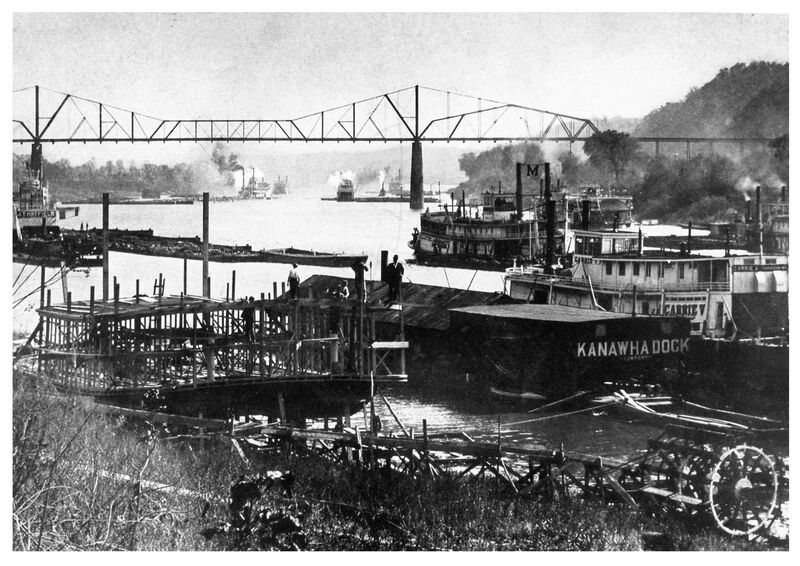 The STAPLES was severely damaged by a boiler explosion in 1912 but the wreck was salvaged and the boat rebuilt as the PEERLESS where my 9 foot pilot wheel did duty in the pilot house (see page of photos from Dave's river room, click here). Just in - 1904 albumen print of the Anchor Line boat HILL CITY at St. Louis 1904. Have never seen such a l-o-n-g boat with so much extra length between the stacks and the bow. She seems to be transporting wagons and/or carriages, lots of wheels visible on the top deck. ORIGINAL ALBUMEN PRINT OF THE HILL CITY TAKEN 1904 AT ST. LOUIS. TOP DECK LOADED WITH CARRIAGES, WAGONS OR CHASSIS OF WAGONS AND CARRIAGES ON TOP DECK. GREAT OLD PILOT HOUSE AND PADDLEBOX LETTERING. PRINT ONLY ABOUT 6 X 8, LOOKS BETTER IN THE SCAN THAN IT DOES WITH THE NAKED EYE. 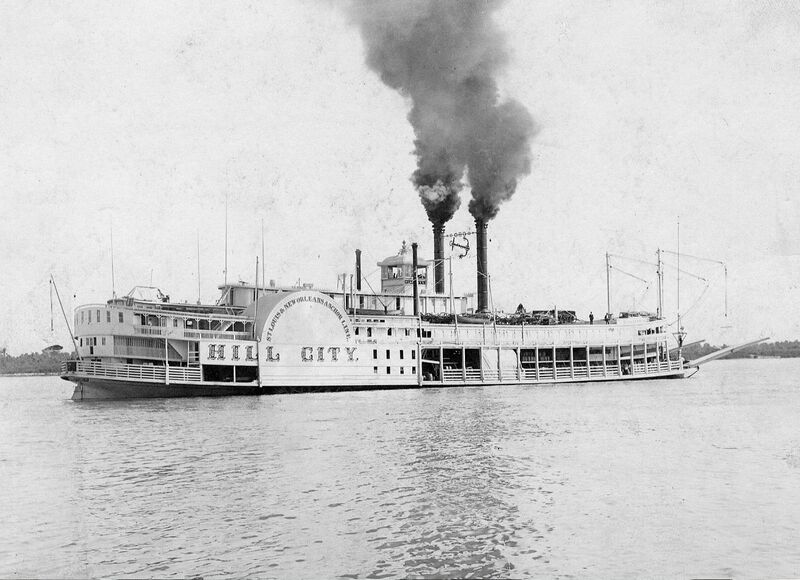 According to Way''s she was originally the City of Monroe, built 1887. 275 x 45 x 8. Obviously a Howard built boat. Badly damaged in tornado at St. Louis May 1896, then lengthened and rebuilt and came out as Hill City - 327 x 44 x 8.5. 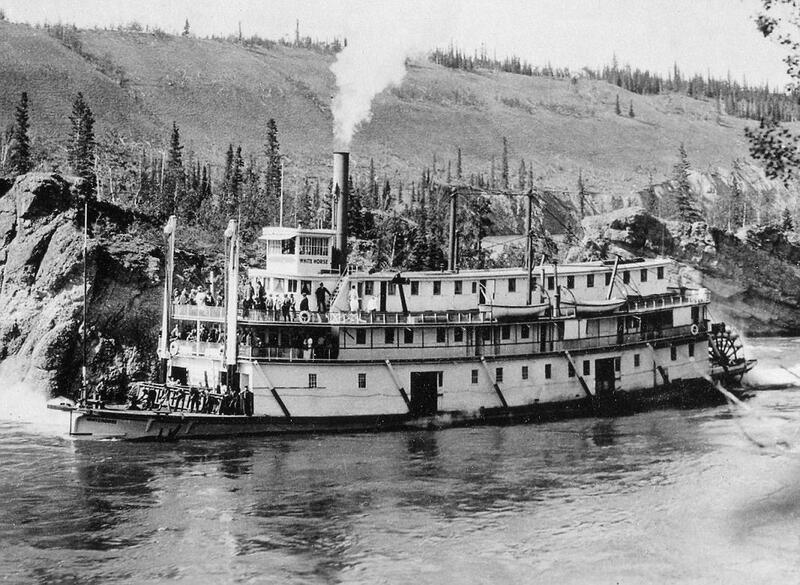 So they lengthened her 52 ft. She was remodeled into an excursion boat in 1903 and named Corwin H. Spencer. Some years ago someone gave me a big old iron bearing block which they said came off the Spencer. I still have it. The Five Finger Rapids are located on the Yukon River, Yukon, Canada. Four islands divide the river into five narrow channels of which only the easternmost channel is passable. Five Finger Rapids is mentioned in Jack London's novel The Call of the Wild and in Alastair Humphrey's novel Thunder and Sunshine. This shows a photograph that the artist based Ray's painting of Captain Cooley's AMERICA on. The present owner of the painting is Terrell Dempsey of Quincy, Illinois. Terrell was living in Hannibal, Missouri when he wrote Searching for Jim: Slavery in Sam Clemens's World to which Dave Thomson contributed research and illustrations. Dempsey's book is Searching for Jim: Slavery in Sam Clemens's World, available from Amazon.com. 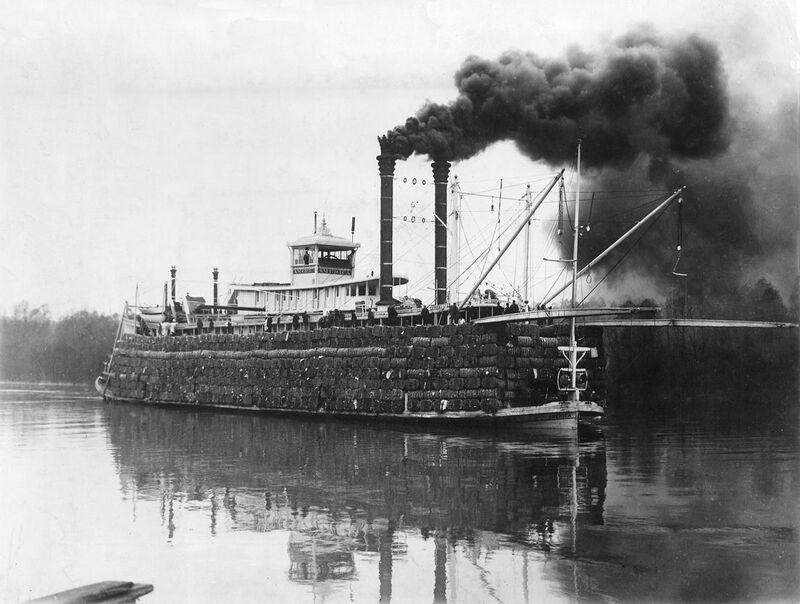 Unknown steamboat tied to a tree stump at Marianna, Ark. Cargo includes bales of hay as well as boxes and barrels. They hadn't lowered the swinging stage but appear to be off loading barrels of something rolled along by deck hands. Marianna is on the L'Anguille River and county seat of Lee County which is in the center of the eastern border of Arkansas. The Spirit of Peoria at its own wharf at the Peoria, Illinois, marina on the Illinois River. 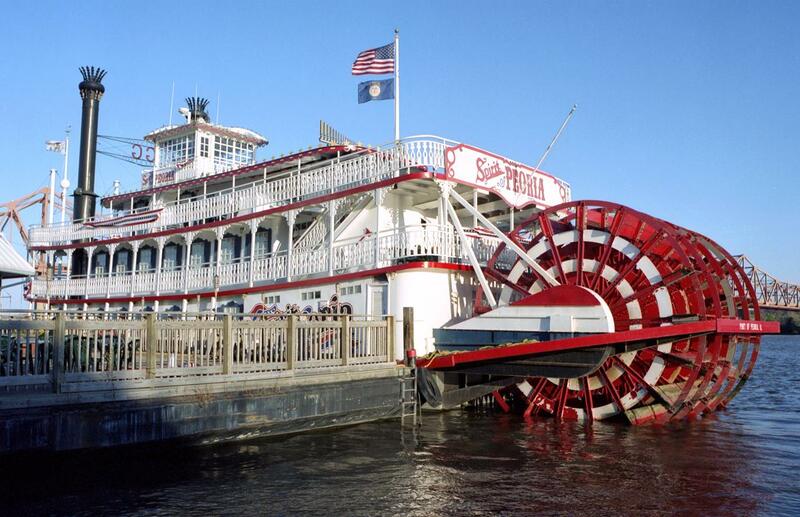 The SPIRIT was designed by architect Alan Bates, and built in 1988 at the Walker Boat Yard in Paducah, Kentucky, the first paddlewheeler ever built there. The propulsion system was designed by Norm Rittenhouse, with steering by Custom Hydraulics. SPIRIT OF PEORIA has no propellers or thrusters, and is powered by twin Caterpillar 3412 diesel gensets, producing 700 kilowatts combined in 208 volt 3-phase voltage. The power is rectified using railroad-style rectifiers, probably from a GM GP38. The DC voltage goes to two traction engines, also from a GM locomotive, which drive the paddlewheel via two 40-foot-long by 1-foot-wide chains. This allows the boat to be comparatively fast and efficient, burning approximately 15 gallons of diesel fuel an hour, with a top speed of over 15 mph. The dry weight is about 275 tons, with a passenger capacity of 487. The boat carries 3,500 US gallons of fuel and 2,500 gallons of water. The regular area of travel of the boat ranges from Pere Marquette State Park near Grafton, Illinois to Starved Rock State Park near Ottawa, Illinois. The boat is owned and captained by G. Alex Grieves, and co-captained by Harold Breitenbach. 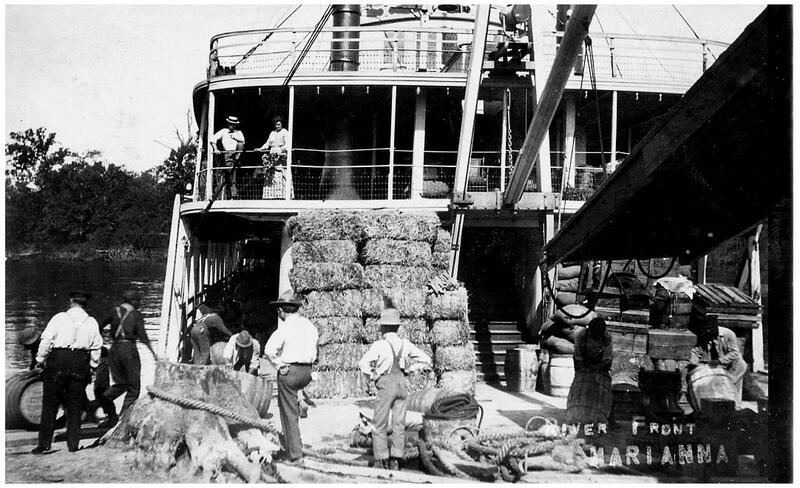 Interesting old photo of the sternwheel "trading boat" NEPONSET NO. 2 at Knight's Landing on the Sacramento River in California. The boat was built in 1884, lost when snagged in 1921. It was 224 tons, 125.1 feet long. 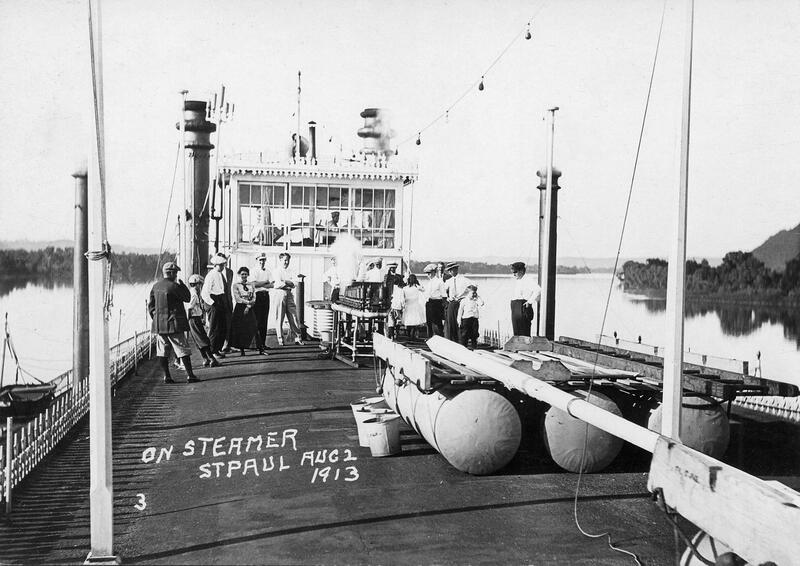 Interesting old photo of the sternwheel "trading boat" NEPONSET NO. 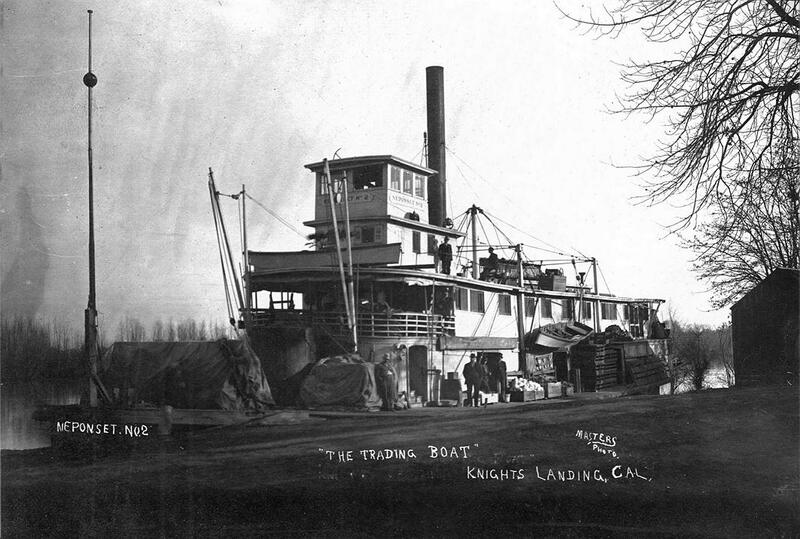 2 at Knight's Landing on the Sacramento River in California.